MJ was greeted with a huge, enthusiastic reception of more than 100,000 people in the West African gold mining village of Krindjabo, Ivory Coast. Michael Jackson was crowned “King of Sani”. He then thanked the dignitaries in French and English, signed official documents formalizing his kingship and sat on a golden throne while presiding over ceremonial dances. 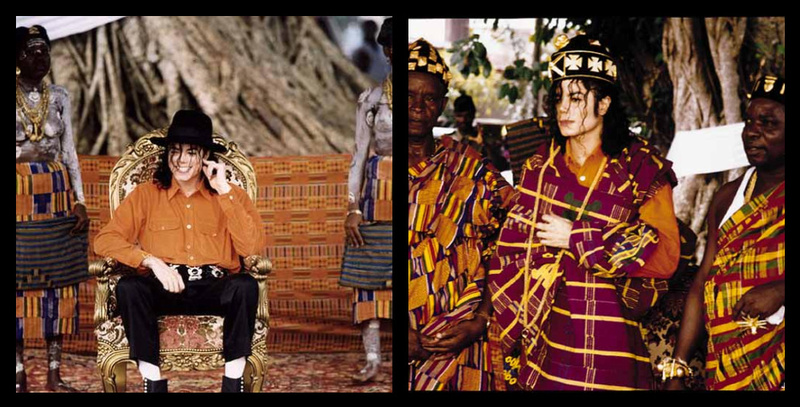 Michael traveled over 30 000 miles to visit several hospitals, orphanages, schools & churches during this visit to Africa. This entry was posted on November 5, 2009 by Andrea. It was filed under Achievements, Biography, Fans, His Legacy, humanitarian, love and was tagged with humanitarian, love, pics.